General Motors has remained silent in regards to its manufacturing operations at its consolidated assembly line in Oshawa, Ontario. The automaker said it remains committed to Canadian investments, The Globe and Mail reports, but has made no specific announcements in regards to building vehicles at the plant in the future. Oshawa Economic Development Minister Brad Duguid, along with Candian Federal industry Minister James Moore, met with GM CEO Mary Barra and GM Canada president Steve Carlisle in Detroit to discuss the company’s Canadian manufacturing ventures. Duguid said he’s “more optimistic” the Oshawa plant will land a future mandate following his meeting with Barra, even though the company has yet to outline any future opportunities. A spokesperson for Moore said the meeting was “positive” and that the Canadian government looks forward to working with GM on future vehicle manufacturing operations. Concerns the Oshawa plant would close arose after GM failed to allocate production of any new vehicles to the plant. The vehicles currently manufactured there will eventually be discontinued or have their manufacturing operations shifted elsewhere, like the Chevrolet Camaro, for example. GM also made a production commitment with the Canadian government following its bailout in 2009, which expires in 2016, leaving it little reason to stick around. Producing vehicles in Canada is more expensive than in the United States, Mexico or other countries. The Globe and Mail says costs of electricity, regulations, labor and the transportation of vehicles into the United States and other markets from Canada contribute to the higher expense. Canada’s dollar has dropped in value as of late, making it cheaper for American corporations to operate there, however Barra said currency fluctuations will have no impact on GM’s future production decisions. This is in the hands of the CAW. If they are willing to work with GM they will get work if they refuse this will become a ghost town. GM has many other plants where the locals are willing to work with GM. It’s called a race to the bottom when the civilized world competes with Mexico and China. How many ghost towns already exist in the US? The Canadian economy is well diversified and the GM plants is far from being the only employer in Oshawa. Very,very true my friend! I will walk before I will ride in anything foreign especially [email protected]!!!!! Junk! I really hate them in NASCAR! Your point is awesome!!! 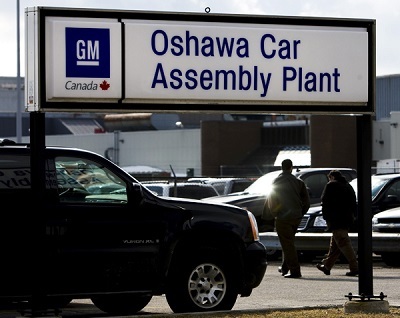 I’d like to see GM close its Ramos Azripe Assembly Plant in favor for Oshawa Assembly. I definitely want to see the Chevrolet Trax and Buick Encore production to shift to Oshawa (especially once their refreshes come). Hopefully Orion Assembly gets a new Spark (Opel Karl), Sonic Sedan/Hatch, and Verano Hatch around 2017. It has to do most with the ability to negotiate a contract as to if they get work. Places like Lordstown and the Wentzville plants locals found if they deal in good faith that they win the contracts, get steady work and in the end make more money. GM can make cars about anywhere they want and with the over capacity they have now it gives them options to shop products around as they can build them just the same anywhere needed. Many of the UAW locals have learned this and that is why we have more and more product coming back to the states. Just look at Michigan and how much has returned there. I truly hope and wish the Oshawa plant survives as its one of GM’S crown jewels in terms of quality and productivity hands down. The Canadian Union formally CAW now UNIFOR has realized the situation and in my opinion has negotiated responsibly the last contract they now have a three tier wage system with new employees making far less and minimal benefits. When I read that labour is a huge reason why GM may leave I wonder how that is with a three tier system. It would in my opinion be a huge mistake to close a gem like Oshawa who by the way have been building top notch for 100 years, they deserve product, don’t forget there government was there to help when needed I never seem Mexico step up like the American & Canadians did! Do the right thing GM allocate product to Oshawa they deserve it. What turns my stomach the most is all the driving around I do, the more foreign junk out there I see! It just makes me sick and the junk out there is no cheaper then the GM I love so much!! In fact,tge foreign junk is way more expensive to insure and the upkeep far more then anything domestic!! Please keep Oshawa open and keep Canadians working to make this auto brand loyality very happy and proud to drive GM!! !